At Santa Monica Maserati, we offer competitive financing rates and terms on our great selection of new and used exotics, cars, SUVs, and trucks..
Maserati dealers and their customers demand the best, which is why Maserati Financial Services offers a wide range of flexible financing, leasing and vehicle protection options for Maserati customers in the U.S.
With retail financing terms of up to 84 months on new Maseratis, 72 months on pre-owned Maseratis, and flexible lease terms of up to 60 months, Maserati Financial Services offers tailored financing plans that are backed by first-rate customer service — the hallmark of our business. The financial specialists at Maserati of Santa Monica work seamlessly with Maserati Financial Services and understand the precise needs of the Maserati buyer. We can help you decide the financial package that best suits your needs and ensure a quick response time. With Maserati of Santa Monica and Maserati Financial Services, you’ll feel secure in the knowledge that you can choose a plan that matches your individual needs. We are committed to meeting the exacting standards demanded by Maserati owners, and want to become an integral part of your overall ownership experience. Our finance experts are here to guide you through the financing process and help you get into your new vehicle. 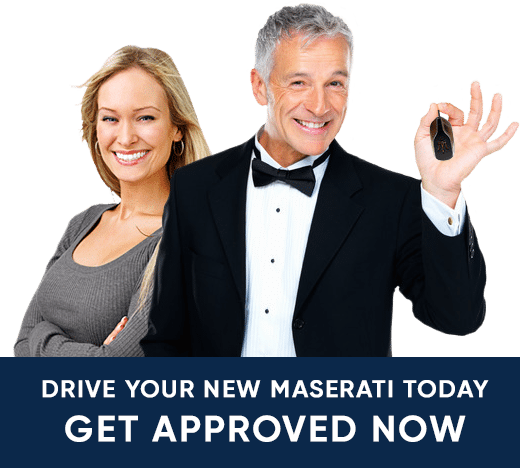 Contact Maserati of Santa Monica’s finance team today, or if you’re ready to start the financing process, you can fill out our secure finance application online. Visit our Maserati of Santa Monica finance page to get pre-approved today! The staff within our Finance Department is dedicated to putting you in the car you want, at a price you can afford. We also offer competitive auto leasing options for our customers who are not looking to purchase or finance a vehicle. Whether you are looking to finance or lease your new Maserati car, truck, or SUV, our finance experts will work to arrange affordable payments for our customers.